Will and Vanessa Lark: Suerte La Roja! I thought the sports highlight of my summer was going to be the Lakers Championship, but it appears that that was only the beginning. 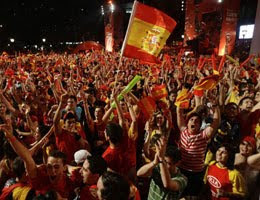 It has been a nonstop celebration on this side of the Atlantic with Nadal's Wimbledon win last Sunday and this week's win for Spain. It's safe to say that this weekend will be all chaos for us here in Espana. We're off to Pamplona on Saturday for the Running of the Bulls and back to Vitoria on Sunday to watch Spain in the World Cup Finals! Please try to contain your glee, V.